Your skin has a Bright New Future! Intense Light Therapy rejuvenation system is an effective advanced anti-aging facial that may show visible improvement in skin over all beauty, tone, smoothness, and the effects of sun-photo damage. If you want to vanquish trouble spots, this treatment may be right for you! Intense Light Therapy delivers light-photo-stimulation, allowing the body to improve it's own fibroblast activity within the dermis, resulting in increased collagen production and cellular energy. 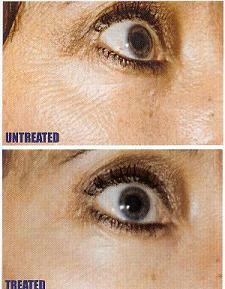 It is a regenerative-type facial treatment, and much safer than Laser treatment. 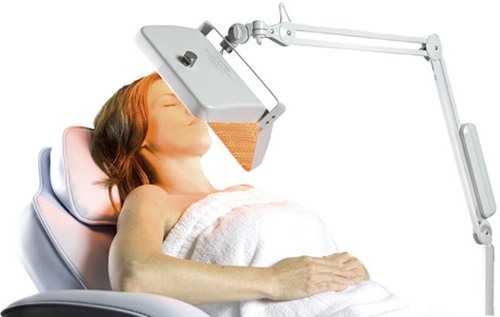 Intense Light Therapy is for the beauty & improvement of aging skin, and acne! Gentle, effective, and non-invasive, you'll may a difference with your first treatment! All skin types can benefit, as this treatment is gentle. Helps the skin repair itself...for beautification, after surgery, or photo-damage. What is Intense Light Therapy? The technology is based on established research using Intense Light Emitting light, to deliver within the spectrum of red, blue, amber, and infrared energy. The Intense Light Therapy draws from research and utilizes the same wavelengths for maximum results. How does this light therapy differ from its competitors? Many competitors use only one wavelength, instead of four. Light Therapy will change the way you see LIGHT! How does the treatment work? Light is made up of different wavelengths that effect the skin. For example - Vitamin D is produced from exposure to sunlight; premature babies with jaundice are treated with phototherapy, and collagen production is stimulated by red and infrared light. The Light Facial Therapy stimulates cellular metabolism, resulting in increased collagen production over a series of treatments. Unlike medical lasers that use intense focused light/heat to damage and fractionate skin. 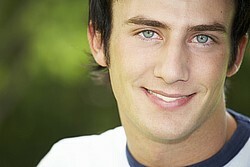 Light Facial Therapy delivers light energy that is safe, and comfortable. No topical anesthic is used. Note: Patient eyes are protected during treatment with eye shields. Collagen and our skin. Our skin looses the ability to produce collagen over time. Collagen production can be stimulated by LIGHT ENERGY over a series of treatments, giving the skin a more youthful appearance. Consistency brings enhanced results. The treatment has a calming affect on inflamed or irritated skin. Helps the skin to heal from UV damage, including sunburn. The Lymphatic System is also stimulated through light therapy, increasing the bodies ability to heal through detoxification. Rosacea usually calms down significantly after these treatments. Is there scientific proof this works? Results on the skin have been thoroughly documented. Research has found that it has a simulative effect on biological cell activity, including increased collagen production. DERMATOLOGY TIMES: "All aspects of wrinkling, skin coarseness, pore size, irregular pigmentation showed visible improvement with Photo Rejuvenation." WEB M.D. HEALTH: "The treatment is especially effective at improving the appearance of the face, neck, and chest; reducing signs of aging, wrinkles, and age spots." ABC TELEVISION: "A process called Photo Rejuvenation can smooth away wrinkles, help erase age spots, and relieve the symptoms of Rosacea." Blue light in the 405-460 nm rage is used over the skin for 15 - 20 minutes twice per week for 4 weeks. The best candidates for blue light therapy are those with maily infammatory acne lesions (papules and pustules) that contain P. acnes bacteria, which causes the acne inflammation, and molecules called porphyrins. Then porphyrens are exposed to certain wavelenths of light, they produce free radicals that kill the P. acnes baceria, and the inflammed acne lesions clear up. It is also believed that the light creates an oxygen exchange, and bacteria cannot live in an oxygenated state. Dermatologist Tony Chu published in the British Journal of Dermatology, said the blue light killed off the bacteria that causes spots and the red light helped the skin heal. Sessions under blue and red light has been shown "radically" to help clear acne in moderate and less severe cases. "As more people become antibiotic-resistant, this new treatment looks set to help thousands of acne sufferers across the world," Dr Chu said. "The combination of red and blue light attacks the acne (bacteria) and heals the skin, through... anti-bacterial and anti-inflammatory actions, and without any significant side effects. Light therapy for acne is considered "cosmetic" and is therefore not covered by most insurance, even when performed in a physicians office. "I was getting these small wrinkles forming over the past few years, now they are gone. I was just starting to get those lip lines and wrinkles above my top lip and they are almost gone too! Even the dark age spots have faded a lot. I feel so good about the Intense Dermal Anti-Aging Light that I recommend it to everyone!" "After using the LightStim LED light for the past 6 weeks, I have seen and felt several dramatic improvements in the skin on my face. Since I was a...teenager I have had severe, deep acne on my face and very oily skin. For the first time in over 15 years the deep acne on my face has subsided, the surface of my skin has started to clear up and there have been noticeable changes in the redness diminishing. The pore size has diminished, I have experienced an increased smoothness in my overall skin and to my absolute surprise, the oiliness has been drastically reduced. These are miracles to me! "...I am 38 years old and I was losing hope. I could see the fine lines and wrinkles forming on my forehead and around my eyes. I was getting age spots! That really bothered me, they were mainly on my cheeks. "I have had mild acne since I was a teen. Over the years it has gotten worse and the acne is now deeper and more painful then when I was younger. I have tried a multitude of different acne treatments to fight this battle. My experience with the Light treatment was excellent. It is so easy to use and convenient...I love the warmth of the light on my skin, I feel like the lights really penetrate deep down to cause healing of the acne under my skin. In the Beautiful Rocky Mountains! Lori Welter M.D., Medical Director. ©Pages, photos, and information on this site are protected by copyright laws. Medical Esthetic facial treatments may require indirect supervision of our Physician, Dr. Lori Welter. For reference only: This is not a Medical Dermatology office in Logan Utah, for the care skin diseases.. We offer Advanced Skin and Facial Care for acne, aging, and photo-damaged skin. When needed we refer patients to Budge Clinic, Dr. Robert Young of Rocky Mountain Dermatology, Dr. Nathan Hansen, Dr. Kelly Hubbard, and Dr. Brad Summers.